It’s Easter week and so I thought I’d share a little craft/DIY project that’s perfect for the holiday. I love seeing little guys in bow ties and a bow tie onesie is a great holiday outfit option. 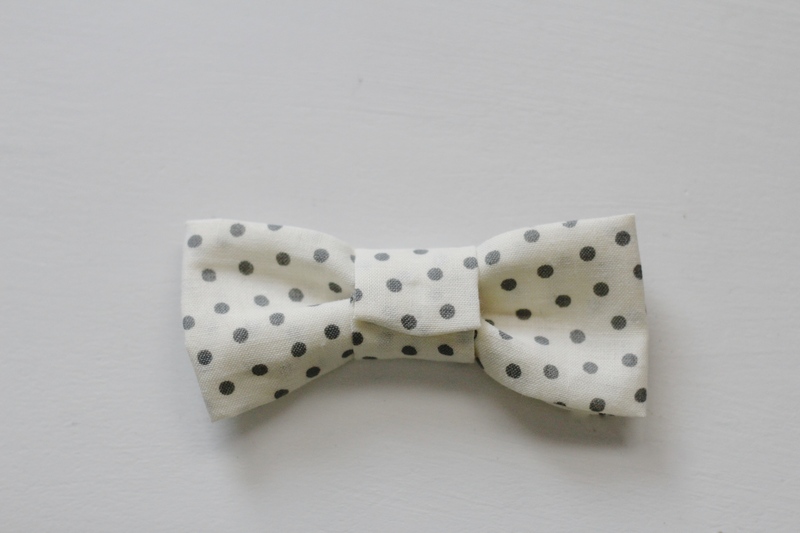 These little bows could also be useful for little girls hair accessories too so it’s a great skill to learn if you have a little girl or boy. I haven’t found a great tutorial on how to make them so I thought I should create one myself! It takes minimal supplies and little sewing skills. Another great thing is they don’t take very long to make so you can whip up a bunch easily and give them away as gifts too. Here goes! – Fabric of your choice. – Snaps (you can hand sew them or use a snap fastener) I used size 15 for mine. 1. Cut two pieces of fabric. One bigger size- 9×4 inches. One smaller size 2×3 inches. 2.Take the bigger piece of fabric, fold it in half so the right sides are touching and the back of the fabric is facing out. Sew along the one end and across the the length of the fabric. Leave the other end open so you can turn it inside out. 3. Turn the piece inside out so the right side of the fabric is now facing outwards. Fold in the open end and sew it shut. You now have one long enclosed piece of fabric. 4. 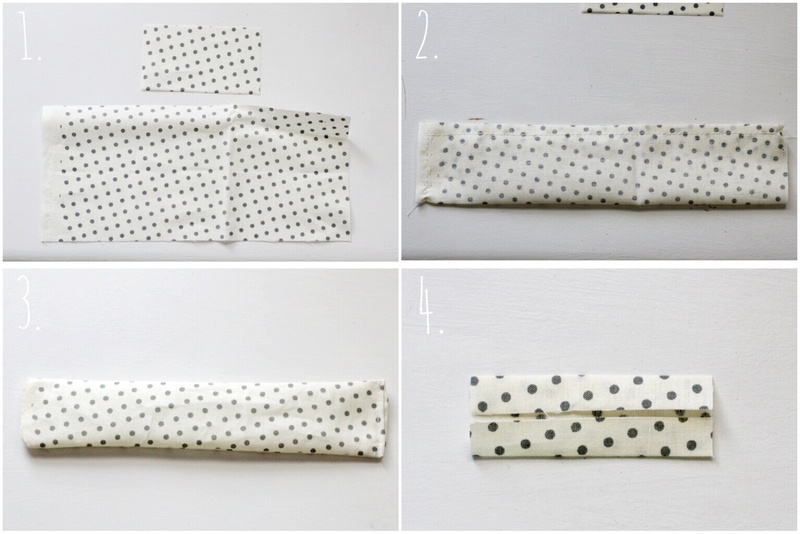 Take the smaller piece of fabric and iron it in thirds (right sides facing out). See picture above. 5. Take the bigger piece of fabric and fold it in thirds over lapping the ends slightly. 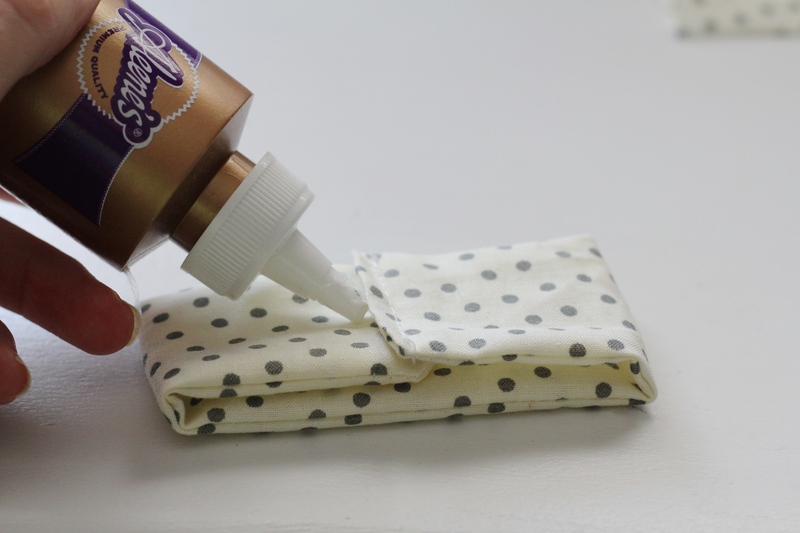 Take fabric glue and glue it together. This will be the back of your bow tie. 6. Next take it and pinch the fabric together in the middle to create the shape of the bow tie. Dab some glue on to secure it together. 7. 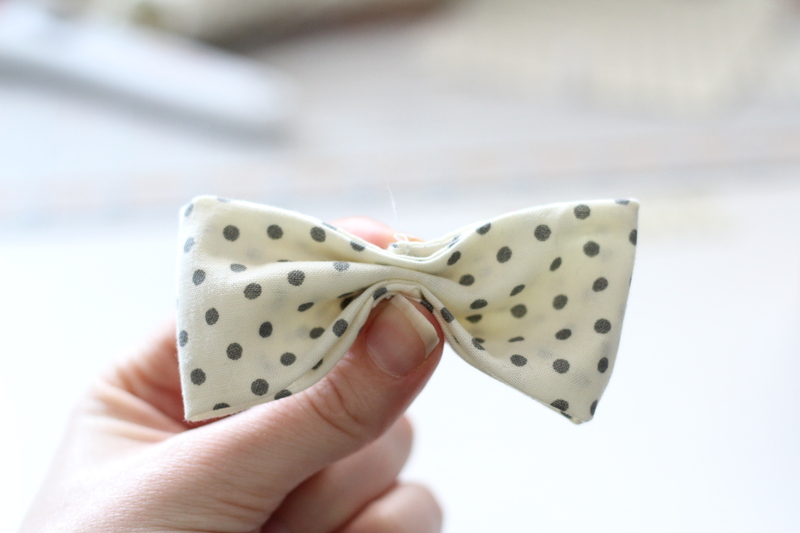 Take the smaller folded piece of fabric and wrap it around the middle of the bow tie. Make the ends meet on the back of the tie. Glue it together in place. And that’s it for making the tie. 8. To attach it to a onesie, I used a snap fastener (bought at Joanne Fabrics for under $8) and secured the socket snaps on the back of the bow tie. You can also hand sew the snaps in place if you don’t own a snap fastener-just make sure to buy the correct snaps. Make sure to only go through the back half the fabric and not all the way through to the front or you will have one goofy looking bow tie. I put two on each bow tie to make sure it laid nice and flat on the onesie and wouldn’t easily come off. I marked the onesie the same distance apart and attached the stud snaps in the front middle of the onesie. What’s great about doing them this way is they are easily interchanged depending on the occasion and outfit. 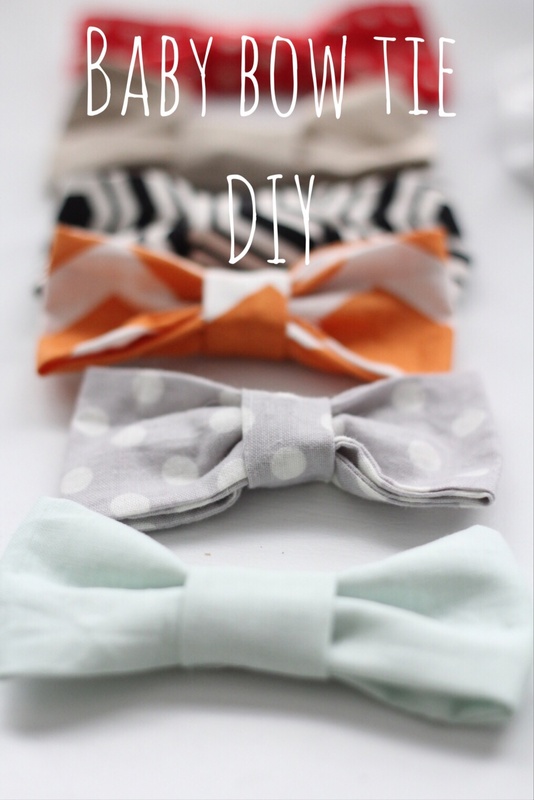 Just follow the same steps to create other bow ties in different colors and patterns. 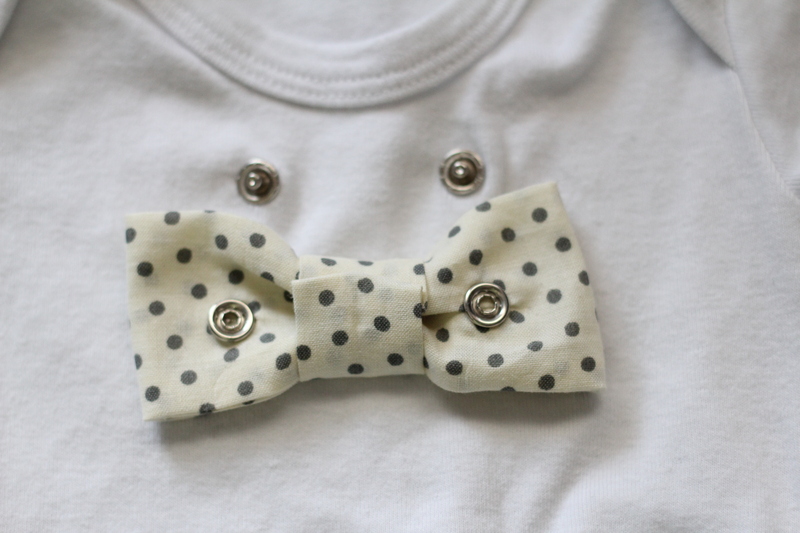 They simply snap into place and when you need to wash the onesie you detach the bow tie and throw the onesie in the wash. I’ve made the onesies in every size for Little Mister so that I am able to reuse the bow ties as he grows older as well. Just make sure to use the socket part of the snap on the bow ties themselves and the stud snaps for the onesies. 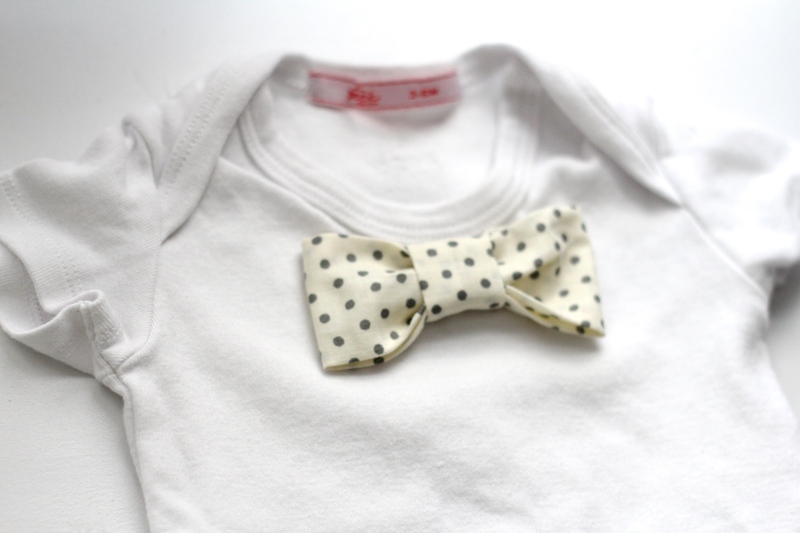 Also, use the same size snaps for both the onesies and the bow ties or they will not work together. So there you have it. 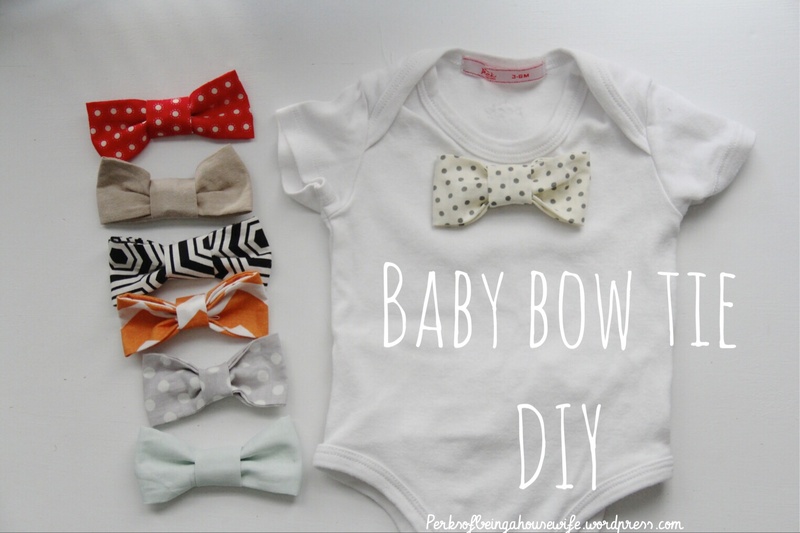 Who said baby fashion couldn’t be cute and easy to do yourself? Happy crafting, but more importantly- HAPPY EASTER! 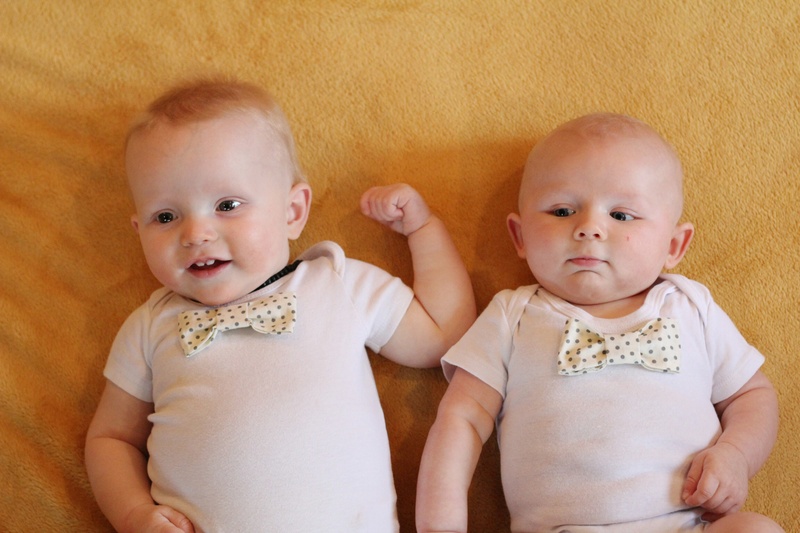 Here’s Houghton and Myles sporting their bow tie onesies. Aren’t they just too cute?